We have reached the point when thousands of persecuted people can be floating in terrible danger in boats in our region without calls for urgent action or offers of immediate assistance by leaders of either of our two major parties. Like many other Australians I am ashamed and appalled although these words seem to have lost their strength. Of course this is just the latest tragedy. The week began with media coverage of a five year old child suffering from post traumatic stress syndrome as a result of her detention in Australian run institution on Nauru. 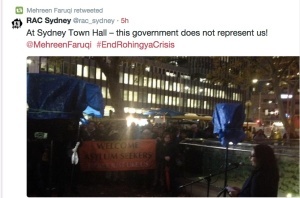 Tonight the Refugee Action Coalition organised a rally at Sydney Town Hall where we called on the Australian government to offer humanitarian help and an opportunity of resettlement to the thousands of persecuted Rohingya who have escaped Myanmar and Bangladesh in boats. While some have now been rescued, many others are still in mortal danger. Those rescued have many urgent needs. There is no doubt that the Rohingya people are persecuted, indeed many have said they are currently the most persecuted people in the world. This is a case of deeply rooted historical and systematic discrimination accompanied by massacres, detention and terrible beatings. Tonight, I emerged from the Town hall station at dusk and saw about 30 young Rohingya standing in a line facing workers and shoppers as they headed home. 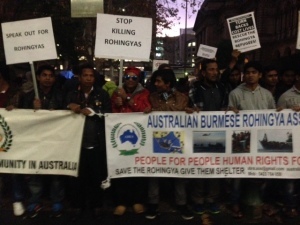 Behind them were hundreds of other protestors, including young Rohingya men, many of whom fled their Myanmar homeland in which they are denied citizenship in earlier waves of persecution and lived in Malaysia or Indonesia before taking boats to Australia. They were locked up in detention for many months, or even years. 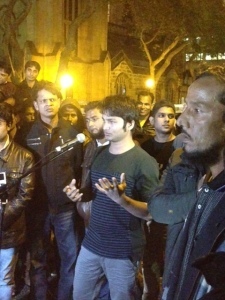 Many attending tonight's protest now live in Sydney on bridging visas. Most people living on bridging visas are forced to survive on an allowance that is considerably less than the dole and cannot legally work. These policies mean that persecuted Rohingya refugees, who are treated as non citizens in their own country, are further punished if they reach our shores. When I arrived, Greens Upper House member Mehreen Faruqi, the first Australian Muslim woman to be elected to parliament was speaking. 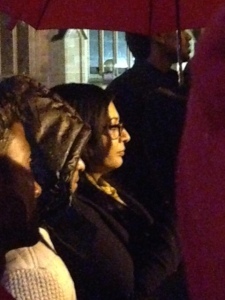 If any MP from another parliamentary party attended the rally, I didn't see them and they didn't speak. After she spoke, Mehreen stood with the crowd listening to the passionate pleas of the Rohingya speakers. I can feel those Rohingya who have died in the sea. I can feel those brothers Rohingya who are working day and night in Malaysia and Bangladesh working to survive their families. Our lives are ending without any security. Our lives are ending without feeling the security of another country's people with citizenship or permanent residency or something with which they can feel they are secure; where if they are missing, they have someone who can ask 'where is my brother? '; where they have a police station, where they have something that is secure for them - but we don't have anyone. We Rohingya are being killed since 1942, 120,000 Rohingya were killed and in 1978, there was another main operation which killed almost 250,000 Rohingya who faded away; and in 2012 again, and in 2014 they do massacre again. I myself when my father was in Malaysia, the military came and beat me with a long stick of wood and I was shouting for my mother and the window was open and there was a lot of people there, a lot of people came along there but they cannot help me because the military were there and they beat me and I was running in the room and my mother was dreaming for a long time. But this is not just the security of the Rohingya. I do believe this is the security of all the humanity, of all the men and women of every race. This is not only the issue of the Rohingya. This is the issue of all humanity. I can feel the cry of men and women and children - the children who cry everyday for their father. I cried for my father. But they can do nothing. It is hopeless. They cannot do anything -- the women need their husbands but they don't have anyone from whom to get love. They can't move from one village to another village. There are restrictions on education. Few of us can speak English. Few of us have the opportunity to get an education. We have talked peace. We cannot speak freely. We don't have free speech. We don't have any media. We can't make a speech. There is no media for us in Burma. This is because the Rohingya talk about peace. We talk about the norms of peace and the Charter of the United Nations .. but there is no one to help. In 1994, they took away the citizenship cards. They kill the Rohingya because of their race and their religion. This is why I request the world to help us. Close by one Rohingya man began to sob. 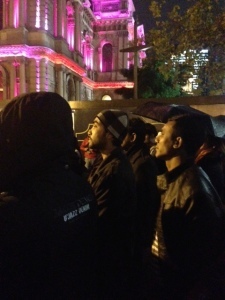 Many of us also had tears in our eyes as it began to pour.